MIAMI: Jose Mourinho was finally given something to smile about as a tempestuous trip to the United States ended with Man United’s 2-1 win over former club Real Madrid thanks to first-half strikes from Alexis Sanchez and Ander Herrera. Mourinho has cut a miserable figure during their two week trip to the United States, lashing out at a lack of transfer activity while reserving stinging criticism for a number of first team players. But seeing his side establish a two goal lead in the first half was encouraging, as was holding Real at bay after Karim Benezema’s goal just before the interval gave the Spanish side hope of mounting a comeback. “I didn’t learn anything (from this tour),” said Mourinho. “I know what Ander Herrera, Juan Mata and Alexis Sanchez are. “I know the kids are very young and need time to grow up, I know my players gave everything and in the last 15 mins we are dead and they bring on Toni Kroos and Asensio and Isco and I thought we wouldn’t resist but we did. “That’s the spirit we need because our first two or three weeks in the Premier League are going to be really hard for us because we didn’t prepare for that.” The Portuguese has been without 12 key players for most of the tour with many enjoying an extended break following the World Cup. 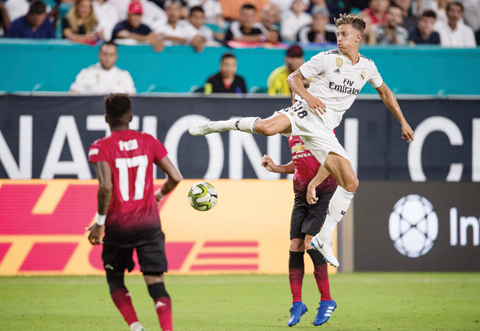 In front of 64,141 at Miami’s Hard Rock Stadium, United were finishing off their pre-season preparations against a Real Madrid side just starting theirs. La Liga starts a week later than the Premier League so new Real manager Julen Lopetegui was able to name the likes of Gareth Bale to start while Germany star Toni Kroos was on the bench. Spanish international David de Gea was making his first start since returning from the extra time given to him following the World Cup and he was almost beaten in the eighth minute – Bale starting a move which saw Benzema fire just wide from close range. Brazilian Fred, who was signed earlier this summer for £52 million, was making his first United start and looked comfortable in his new surroundings. And on 18 minutes, United were ahead. Herrera fed Matteo Darmian and teed up Sanchez who clinically swept the ball home. It was Man United’s first real opportunity – and it was taken superbly. “Alexis Sanchez is fresh, the way the man is running, I think he is in a fantastic condition,” said Mourinho. The second goal which arrived on 27 minutes was equally impressive. Darmian lifted the ball to Mata and once the Spaniard had regained his composure he crossed for Sanchez who was able to divert the ball into the path of Herrera who made no mistake.